The dog park in Buffalo Bayou Park has officially reopened, officials announced on Monday. HOUSTON - The Johnny Steele Dog Park has officially reopened after being hit hard by Hurricane Harvey more than 9 months ago. 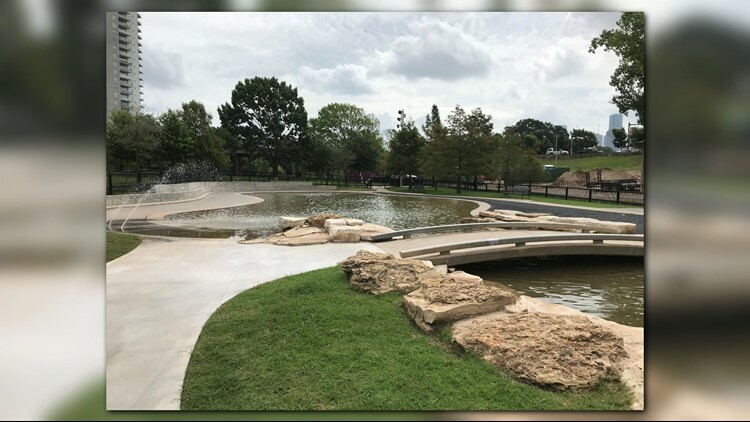 Officials with the park said changes to the dog park will enhance the site’s overall functionality for dogs and their owners as well as the Buffalo Bayou Park maintenance team. This area will experience high water from time to time but the design modifications should improve ongoing maintenance and operations. There is now a new, separate entry portal for small dogs, reconfigured fencing around the small dog area, and a new retaining wall with seating ledge around the pond. The park has also expanded the small dog area lawn and large dog area mulched lawn, eliminated separate ponds for large and small dogs and created one pond, with water feature, for all dogs.